Aged for a year in used Islay whisky casks, Bourbon barrels, and finished in new charred American White oak this special limited edition release celebrates the repeal of Iceland's Prohibition in 1935. Notes include wild honey, green orchard fruits, a hint of salted caramel and a dose of spicy oak. Aquavit fan? This one is extremely limited. Each bottle is individually numbered and only 6000 were produced. Three—count 'em, three—different cask finishes provide an incredibly unique and complex aquavit. Aged for a little over one year in new charred-oak barrels, four months in bourbon barrels, and finished in Islay whisky casks for another four months! Beautiful and delicate spicy vanilla mingle with candied fennel seed, orange peel, and just a whisper of smoke on the nose. The palate reveals nice toasty oak, vanilla poached pears, dried herbs, and honey with a delicately spiced finish. Again, do not miss this one! 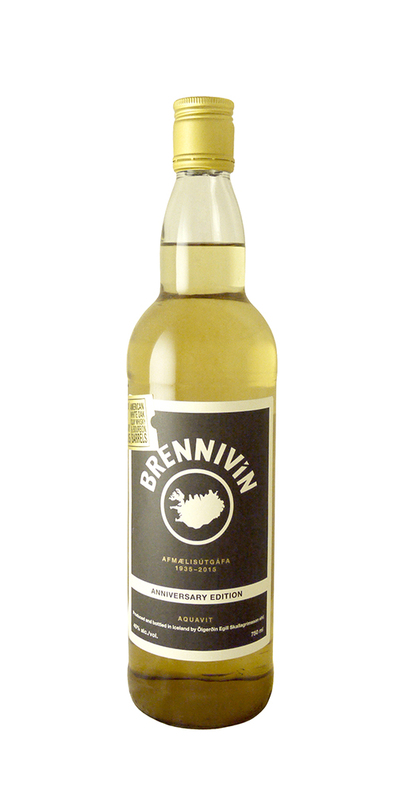 Notify me when Brennivin 80th Anniversary Aged Aquavit is back in stock.